IT equipment is generating more heat than ever and the cost to cool that equipment is increasing. Based on measurements at multiple data centers, 50-80 percent of valuable conditioned air is not reaching the air intake of IT equipment due to unsealed floor openings—some as small and seemingly innocuous as 4 x 6 inches. This lost air, known as bypass airflow, contributes to IT equipment hotspots, cooling unit inefficiencies, and increasing infrastructure costs. KoldLok Grommets are specifically designed to reduce bypass airflow to improve data center cooling. 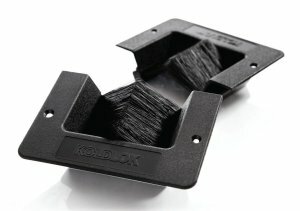 The KoldLok Mini Raised Floor Grommet is the latest patent-pending thermal management solution from Upsite Technologies. Designed with virtually all of the original KoldLok product family features, the KoldLok Mini Grommet is also fire-rated and positioned at a lower price point. With the KoldLok Mini Grommet, optimize the effectiveness of existing cooling equipment and manage the increasing heat loads to ensure site uptime and reliability. The KoldLok Mini Grommet is offered with the static-dissipation feature (Item No. 10052) or without the static-dissipation feature (Item No. 10077). Seal small, 4 x 6 inch (100 x 150 mm) cable openings with the KoldLok® Mini Raised Floor Grommet, the latest patent-pending thermal management solution from Upsite Technologies. Designed with virtually all of the original KoldLok engineering, the KoldLok Mini Grommet is also fire-rated and positioned at a lower price point. With the KoldLok Mini Grommet, optimize the effectiveness of existing cooling equipment and manage increasing heat loads to ensure site uptime and reliability. The KoldLok Mini Grommet is offered with the static-dissipation feature (Item No. 10052) or without (Item No. 10077). Designed to seal small cable openings in the raised floor of new or existing computer rooms. Based on measurements at multiple data centers, 50-80 percent of valuable conditioned air is not reaching the air intake of IT equipment due to unsealed floor openings—some as small as 4 x 6 inches (100 x 150 mm). This lost air, known as bypass airflow, contributes to IT equipment hotspots, cooling unit inefficiencies, and increasing infrastructure costs. KoldLok products are specifically designed to reduce bypass airflow to improve data center cooling. The frame is molded from durable PC/ABS.